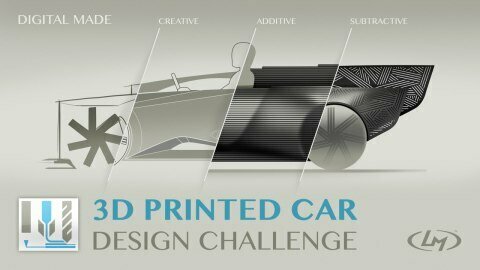 Local Motors has announced the launch of the 3D Printed Car Design Challenge –a contest that’s designed to inform and influence the concept of the vehicle that will be manufactured at IMTS – The International Manufacturing Technology Show in September, 2014. In January, Local Motors and the US Department of Energy’s Oak Ridge National Laboratory have signed a partnership that will require them to develop and deliver the technology needed to produce the world’s first 3D printed vehicle. Local Motors is inviting designers to have a say in how the car is designed. The 3D printed car must include at least two seats, four wheels, a battery pack, windshield, and other major functioning parts of a vehicle. The 3D printed car design is a challenge that will decide the factors such as the structure, material, and the best way to fasten to the structure. The challenge will be open until May 13, and the winner will be announced on May 30. The final product will be printed in September using a hybrid machine that is currently being developed at the Oak Ridge National Labs. This printer will print the vehicle in its entirety, as a fully functional 3D printed electric vehicle. The winner will be awarded $5000 cash, as well as a trip to the IMTS to participate in the 3D printing of the vehicle of their design. Up to five others will be selected as “Innovation Awards” winners. The submissions will be voted on by the Local Motors Community, on Local Motors.com and finally judged by a panel of experts led by CEO of MakerBot.